The art of Bidri inlays pure silver into zinc sculptures in intricate detail. The pieces are then dipped into a hot mud solution that turns the zinc black. This 12-piece Nativity contains: the Holy Family, a shepherd with two animals, three wise men, and three elephants. The standing wise men measure 2.25 inches tall. The elephants are 3.5 inches tall. 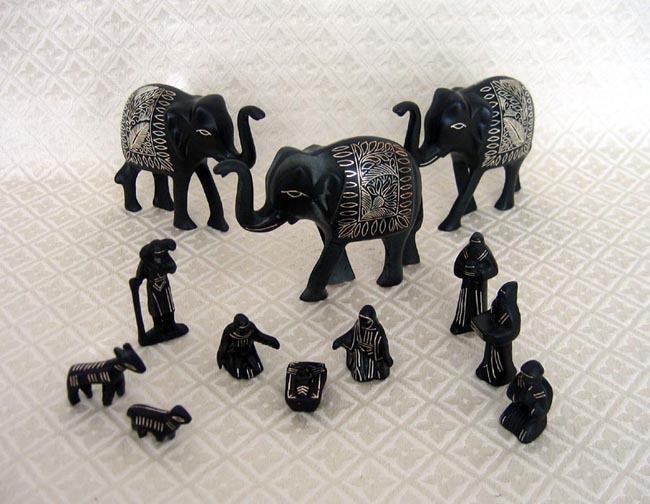 The Aejay organization, located in Bangalore, India, exports the Bidri-ware Nativity that is made in a small village in India in which every family is engaged in this craft. The families in the village live on less than $1.00 per day.